All transactions are safe and secure with a reliable history in online purchasing behind each of our associates. 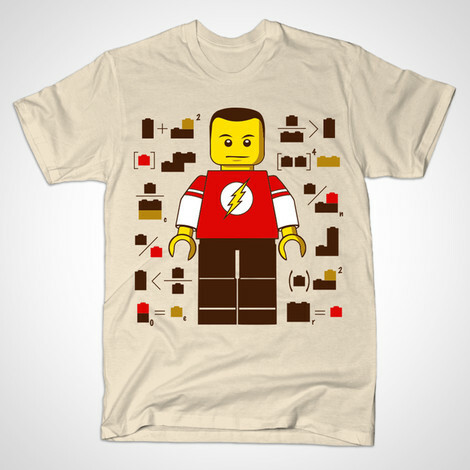 Buy the Lego Sheldon t-shirt to own Big Bang Theory clothing and merchandise. These "Highly Illogical" Lego Big Bang Theory Sheldon t-shirts will remind you of the many humorous situations involving Sheldon. This includes during season 3 when Sheldon gets stuck on a physics problem and breaks into a children's ball pit to use the balls to represent subatomic particles. His roommate Leonard Hofstadter comes to talk him out of the pit, but instead of leaving he hides in the balls and pops up at random, yelling, "Bazinga!" If Leonard, Howard and Rajesh are your favorite geeks, then get a BBT tee or The Big Bang Theory Leonard shirt to bring out your nerdy side. Like Leonard, these clothing items might get the attention of the Penny (Kaley Cuoco) in your life. In addition to the Lego Sheldon tee above, browse the Big Bang Theory Clothing Gallery for more apparel like men's and women's clothes, kids shirts or hoodies.